I sold a few things through eBay and Facebook Marketplace including two Christmas sweaters, two Elf on a Shelf plushies, a baby sized Patagonia coat and a collectable figure. Almost everything was bought for next to nothing at the Goodwill outlet. Seriously, how much can a 12-month sized down jacket cost when paying $1.29 per pound?! I ran out of padded manilla envelopes, so I texted my neighbor and she happily gave me an armload of her used supplies! Luckily we’ve winnowed down who we exchange presents with over the past ten years, so Christmas gifting shouldn’t be too painful. If you’re unhappy with your family’s gifting expectations, I suggest that you plant that seed for 2019’s holiday season sooner rather than later. 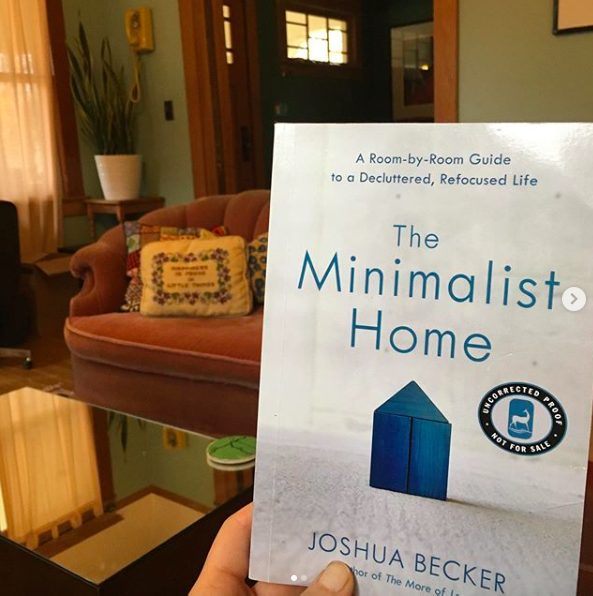 I enjoy reading books on minimalism, as there’s always a new idea or inspiring viewpoint to keep me on track. This one did not disappoint. Made soup last night from leftover drumsticks, a can of beans, and a can of tomatoes. Made a wreath from the rosemary that needed trimmed. Opened the door to the garage to let in the warm air instead of turning on the heat. Driving my husband’s little commuter car every chance I get instead of our van. Genius! I have an enthusiastic rosemary plant that could donate some greens for a wreath. . . thank you! Enjoy! It’s a messy project, but your hands will smell nice for a couple days. Lol! Regarding your number one, love how normal the use of perused packaging is here in China. I needed to send stuff to another location a couple of times and every time I walked into a express-service place they looked through their stash and had a box for me to use. When I dispose of it, I can be sure a garbage collector will be happy to get it and cash it in. As a parent of two autistic teenagers let me just say the NCA principles notwithstanding, god bless Maccas (that’s what we call McDonald’s in Australia). 2. Had a review meeting for my eldest child’s disability services for 2019. 3. Have stuck to our budget like glue this week. 1. My daughter’s friend and her sister came over last night while their parents were out. I was told about it in the morning and that we’d need to feed them dinner. I quickly decided on a recipe to try and went to the store to pick up the needed ingredient (we only needed chicken…I had the other things). When they were over and I started cooking my daughter said, “Oh, I thought we were going out to eat?” Nope! 2. I have been listing things that are sitting around my house not being used on eBay, Poshmark, Facebook, letgo, etc. Steadily selling things. Using pre-used packaging material. I love turning clutter into money! 3. Have been better about making a meal plan and using it so I don’t answer the what’s for dinner question with “I don’t know”. That answer only leads to requests for getting take out. 4. Purchased some cute booties that were exactly the kind I was looking for at goodwill for $7 and a heavy, gorgeous, winter white wool Banana Republic coat for $13. Also had a 20% off text coupon, making them even less expensive! Got home and found some clothes and shoes to get rid of as well. 5. This is a question regarding number 4. I often struggle between “decluttering” and “using things up”. I go back and forth between feeling like it’s better to “have less stuff” and do the one in one out thing, and then feeling like if an item is still useful and I still kind of like it should I just keep it and use or wear it until it’s no longer useful? Anyone have advice with this? For me, I have to consider how likely it is that I will actually use up the thing in question. I have some beautiful yard, but lately (like, the last couple of years) I have only been knitting in pure wool — this is a blend, so I posted it on ebay. I probably won’t use it soon enough to be worth saving. If I haven’t used it in a year, if I don’t have a definite plan, I try to pass it on. If I’m saving it out of obligation, I try to pass it on. I tell myself that having to buy another (from a thrift shop) once in a while, if I declutter too much, is a small price to pay for getting rid of the greater amount of clutter that I won’t use, ever. 1. I also sold another item on Ebay. It was only $10 but I rehomed an item that I wasn’t using anymore. Money in, crap out. 2. I’ve been eating leftovers, having dinner with my Mom at her house and cooking dinner for my daughter one night without purchasing anything. 3. I’ve put up my old restrung lighted tree. The lights don’t all work but it’s free. 4. I’ve also paid my daughters tuition bills for next semester. I’ve done a little research for scholarships for one daughter and found one that she will apply to. 5. I’ve been searching for a part time job to bring in some extra money. (2) I’m wrapping presents in paper that I’ve trashpicked over the years (all of it new in the shrink wrap; it’s something that often makes it onto the curb when folks are moving around here). I probably have a lifetime supply. (3) I shipped off the packages for the out-of-towners yesterday, all in reused packaging. Re #5 – $$ well spent – you get the book and profits to a good cause. Double benefit! 2. I do not own a hair dryer. I use an electric in the window air conditioner/heater to heat my house. It has been the best heater/air conditioner. I use it for my entire house and I bought it at Lowes for under $500 seven years ago. I am aware I am able to get by with this because I have a small house and I live in the deep South, so winter is not too cold, usually. I dry my hair in front of it in the winter….lol. 3. I brought my lunch…dried lima beans that I cooked this weekend. 4. I am wearing really old clothes today, including a jumper I purchased at a thrift store a few years ago for $3.00. 5. I have a cold and I been concentrating on getting more rest and eating more greens and potatoes. I seem to do better, healthwise, when I eat turnip greens, collards, carrots, potatoes…I do not know why. Feel better, Cindy! Eat your green. They are good for you and contain a bounty of vitamins and minerals. I have to agree, Katy. Hangry is a great word, but it is a terrible state to be in. 1) I had a Christmas party/meeting to attend on Tuesday evening. I wore a Banana Republic dress that I bought at the Goodwill Outlet. I love this dress. What a bargain it was! 2) I visited a local thrift store and purchased a set of 600 count Egyptain Cotten sheets, king size, still in the package for the startling sum of $12. I couldn’t believe it. I have needed a set for months. Even new, it is difficult to find higher count 100% cotton, and they are so expensive. They are in the wash now and I can’t wait to put them on my bed. 3) The grocery store where I usually shop honored a competitor’s coupon for $20 off a $100 purchase. I paired this with the weekly specials, digital coupons, and BOGO offers; and I stocked up on items that I would need through the end of the month –coffee,cheese, meat, cereal, dog food. My total savings was $93! I was thrilled. I buy very little prepared or package foods, so I don’t often get to enjoy such huge savings. 4) I forgot to schedule the payment for this month’s electric bill. There is a rather large penalty for late payment $20+ and a $5 fee for paying online. So Monday I went out in a torrential downpour to drop off my check on the date it was due. I combined this with my other weekly errands. I rarely miss this kind of thing, but have done so twice in two weeks. So I have reviewed all my bills this month and made sure they are scheduled on my Bill-pay service. No more surprises. 5) Frugal Fail: I bought some pretty Christmas cards at an estate sale earlier in the year for $1 a box. I had them open on my desk to use and my cat actually threw up in the box of cards. I had to throw them all away. Why did she choose that spot? What was she trying to tell me? Merry Christmas? It is amazing where animals decide to hurl. My Irish wolfhound has a delicate stomach and when he wants to throw up, he seeks me out and will vomit into my lap. Really, I can be in another room reading and he will trot over, push my book out of the way and get sick. It has happened about six times now and I cannot figure out why he wants to give me this offering. Our other giant dog is rarely sick, but when he is he will practically throw himself through the door to get outside, rather than vomit in the house. Although, I would rather get thrown up on and clean it up than have a box of Christmas cards ruined! If I correctly recall my reading many years ago of The Hidden Life of Dogs by Elizabeth Marshall Thomas, your Irish wolfie may be trying to give you a gift–along the same lines as a cat who presents you with a freshly killed mouse (as our Betty did a while back). I’m afraid we weren’t really appreciative of the mouse, either. Your pup comes to you because he knows that you will care for him. :-). When my dog really wants or needs something, I am the family member that he looks for. We recently bought a rug at Lowes. It was too much money, but the perfect size, shape and color . The first day it was down, a cat threw up on it. I have worked on the stain once without success, but I am going to try again. Ava, I sympathize. I love my kitty and my lovable old mutt, but they can be exasperating. My friend told me that the cleaner at the Dollar Tree would get anything out of carpet and upholstery. I think it’s called fabuloso. 1. Bought Christmas cards at Dollar Store yesterday (12 to a box for $1/box). No foil etc. so recyclable. 2. Wore a Goodwill thrifted sweater to work yesterday. 4. Found a beautiful white linen blouse from J. Jill at the Goodwill for $7 in like-new condition. My mom had a pretty significant melanoma removed a couple of years ago so she tries really hard to cover up even in hot weather and this cute blouse will be a good “topper” when she travels. Washed carefully, ironed and wrapped it up for under the tree! 5. Have a work meeting at lunch today so free lunch. PS almost forgot no. 6 — when we put up our tree our old angel was nowhere to be found. Found a new (to us) one at Goodwill bot $3 but half off color so $1.50! I’ve purchased some Dollar Tree Christmas cards too. I’ve been surprised; they are actually pretty nice, have a good picture, an actual message on the inside and not just “happy holidays” or “season’s greetings” type of message. The boxes I purchased were for my son to write cards for his group home staff and day program staff. Thanks for sharing about McDonalds. It’s very *real*, which can be rare on the internet where things are often portrayed as rosier than reality. – Baked a vegan orange chocolate chip cake for partner’s obligatory work pastries. Flour + chocolate chips from the pantry is way less $$ than spending $30 on a box of vegan donuts. – Unsubscribed from postmates emails. Too many tempting offers & now that we live close to a market, no excuses for mindless ordering out. -My local library will start offering museum passes this month, so I marked my calendar to sign up. I have museum trips planned for winter break so this will be great. – Walked straight to Target after work to return some prizes for a contest I put on at school with my own money. Turns out all kids prefer bouncy balls to shiny lip balms! I was happy to to see that. Frugal fail: I realized I missed an important step in the graduation process for my grad degree & paid a $10 fee in an online form to correct mistake. Turns out I could have emailed an advisor & had it done for free. Lesson learned- check in with a person first! 1. Invited to a baby shower! Yay! I found an awesome stash of brand name pacifiers, bottles, and accessories in a clearance bin at the grocery store so I snatched those up. We also wanted to gift her a nice baby wearing wrap from her registry so my mom offered to chip in for that. It was nice to both share a bunch of items that I got a great deal on and something that the mom-to-be picked out for herself. Card, box, and gift wrap came out of my thrifted stash. 3. Carefully read credit card statements and discovered that my husband bought SIX tarps back when we needed two, maybe four. I talked him into taking back two of them. This same review of the credit card also showed that he was being charged to our family account for something, but reimbursement was going into a different account. We found a way to move things around to even this out. 5. Crazy tasty asian night for dinner this week. I cooked everything up from the freezer that we’ve purchased and wasn’t our favorite. I figured we have a better chance of eating it up if it was cooked rather than frozen and I was right. It provided dinner for four as well as four+ portions for lunches. Great job on restraining your handrails and vanity! I would not have thought of that and what a savings! I’ve been spending money like a drunken monkey, but it’s been on stuff I actually need. 1. Our dishwasher was making a horrible screaming noise every time we ran it, and my family of four is unwilling to handwash all our dishes. (Plus, we’re looking at selling at some point in the future, and we’ll need a dishwasher at that point.) A friend referred a guy that installs used dishwashers! The cheapest one I found at Best Buy would be close to $700, installed with warranty. This was $250, installed, with a verbal promise to replace it if there’s a problem in a reasonable time period. No waste, less money, local business — perfect! 2. Our family stopped by Goodwill two nights before, to look for a gift for a gift exchange. (I didn’t find one, I’ll be better prepared next year — I’m usually better at this.) We found a sofa instead! Our old one *really* needed to go, it was too uncomfortable to sit on and was basically a big dog bed. For less than half the price at the cheapy, slave-labor furniture we came home with a Lazy Boy sofa that we can reupholster when the time comes! 3. Cooked up three of the pumpkins I got from a friend. They’ll become a pie and pumpkin bread. Plus seeds for snacking! 5. Found a recipe for Christmas bark to use up the white “chocolate” melts, that won’t be horribly expensive. Melts, dried cranberries and pumpkin seeds (instead of dried cranberries and pistachios, which are really expensive.) Plus, all bulk goods are on sale this Friday, Saturday and Sunday at the local market, so it’ll be really affordable for gifts for teachers, etc. That Christmas bark recipe sounds tasty. A few weeks ago I bought some “Holiday Munch Mix” at the local Senior Center’s annual rummage sale. That stuff was amazing! Unfortunately, there was no recipe or ingredients list, but it looked like they used caramel popcorn, white chocolate chips, Chex cereal, and Cheerios. I’ll check online for a similar recipe and experiment with ingredients. Katy, I forgot my best find at Goodwill. A new entry for your “Katy won’t buy used” list? In my house, I’m the dish washer that’s screaming, not the machine. Hate doing the dishes! Hmm. I can only think of 4. 1. Listing daughter’s twin trundle bed for sale. We upgraded her to a full size when mattress needed replacing. She’s 17 and about to go to college, but having a larger bed to use for a guest will be nice and this bed will likely go with her when she graduates from college. 2. Cooked breakfast at home all weekend. Hubby and I usually go out for a morning date one of the days, but this weekend we took turns cooking. 3. Did some maintenance on front load washer to keep the smell at bay. This requires running a tub clean cycle and draining a hose and washing a filter. 4. Checked out e-library book for free! Susan, I have to do the same thing to our front loader. The hose and the filter are covered by a little latching door on the front of the machine. Cleaning out the filter is kinda yucky, but after having our washer practically rebuilt (under extended warranty) a little over a year ago, I do it religiously. The repair guy told me to use Tide brand washing machine cleaner. …thinking exactly the same thing. You’re going to gripe about someone who paid TWO DOLLARS for a snack?!? Nothin wrong with McDonald’s. As a cross country traveler who has estimated decent food would be or else under estimated how much food I and my six foot six twenty something kid would need in the coolor, their dollar menu items have saved us more than once. And don’t forget the reliable bathrooms at McDonalds. No matter where I have traveled in the world, if they have a McDonalds then I know there will be a bathroom. Plus, I love the fillet of fish sandwiches. The legacy, I’d guess, of being raised Catholic by a single father of six who did not know how to cook fish. Every Friday he would take us there for a fish dinner. Three of us were his step children that he was left to raise alone and they were not Catholic but they soon learned that there was no meat on Fridays! Lindsey, your story warmed my heart. Kudos to your dad. 1. Had a relative visit over the weekend who wanted to be taken out to a very fancy restaurant for his birthday, which we did while ordering pretty modestly priced entrees. Instead of $30 in dessert, we went back home for homemade banana-walnut muffins and coffee. 2. The leftover muffins became my breakfast this week. 3. Our den is rather cold. Instead of boosting the heat or rolling in an oil radiator, I cover up with a heavy crocheted throw made 28 years ago for our baby son to play on. It used up scrap yarn and has held up great all these years. 4. Katy is one of the few frugalists who mentions visiting a bakery outlet. I do too, and save a small fortune on bread and bagels. 5. All the usual, playing on repeat: Wearing cute thrifted outfits, snagging free e-books via Bookbub, hanging clothes to dry on the rack, brown bagging breakfast, lunch and drinks to work, making up homemade kibble topper out of canned mackerel and rice for our dogs (the one will allergies needs to eat more fish). 1. My refrigerator seemed to have died. I did not want to shell out the money for a new one. My handy husband took it apart and it had froze up. After some thawing it works just fine… Crisis overted. 2. A friend of a friend was giving away her old refrigerator if she could just get someone to come get it out of way. Even though our refrigerator has had recent problems and is fixed, we still went and got this refrigerator. She is elderly without any family so she needed the help. It was a win/win. 3. Cutting meat, dairy, and eggs out of our diet has been a little challenging. We are sticking with it. I’m a little nervous about the holidays since my family is used to a full Southern spread on the table. We can’t eat out at all so that’s frugal. It’s hard to get over the feeling of missing out on meat when we are so used to it, but we will manage. It’s depressing a little, to be honest, but I have read these are all normal feelings so we are trying to embrace it. 4. Made some vegan banana bread from aging bananas. It’s was delicious! 5. Making cozy fires in the fireplace to supplement our heating with firewood my husband chopped up from a downed tree from a summer storm. I admire you for going vegan! I think I would miss dairy more than meat because I love cheese and milk so much. Thank you…I love all three! It’s a learning curve. At least my kitchen skills are becoming more diverse. I spend lot some of time making things look and feel like meat and cheese, lol. I have found that taking a little break from meat (and dairy) helps get used to the new normal, instead of trying to make things taste like they used to. We went camping with my dad, and we thought the veggie sausage tasted fine, and my dad (who will eat anything) thought it tasted really weird. Once you get away from it you don’t recognize the difference as much. Yes and I have noticed things like plain things like apples have a brighter, sweeter taste. did you use the veg web recipe or a different one? If you don’t mind me asking, why are you going vegan? It doesn’t sound like you really want to so I’m just curious what the motivating factor is! My husband has health issues that meds no longer work for, so we are trying a another approach. I am doing it to support him. I wish I could say it’s for the animals, and I do admit this bothers me, but it’s more for health reasons. I hope for less arthritis aches and pains for myself. I have been a vegetarian for years..can’t give up cheese lol…what it has done for me is given me endless energy……I’m 60 and weigh 145 lbs at 5 foot 10….unfortunately i do have to take b12 due to a deficiency…..
Kathy Hester’s website has a recipe for Black-eyed peas jambalaya if you need a vegan southern new Year’s recipe. Her cooking is southern vegan. Oh my, that sounds so delicious. I so appreciate all the suggestions I get here and and put them all in a folder on my phone. I have been browsing her recipes and she has lots of Southern faves,, thanks. Hangry is indeed a fantastic word, and I use it often in regards to both my husband and my four year old daughter! 1. I used a bunch of leftovers (like five or six containers worth) and threw them into a soup. It turned out great. No waste, and we were all well-fed. 2. I found the two lost library books I’d been searching for, which will save a bunch of money (and my library privilege!). Phew! 4. I tried a new recipe, a creamy vegan carrot ginger sweet potato soup (with the giant bag of carrots I bought at CostCo. Now I only have a mostly-full giant bag of carrots, instead of a full one). This turned out really great and everyone enjoyed it, and it was a super frugal recipe. You can slice your carrots, blanch them in boiling water for 2 minutes, and then place servings in freezer bags to pull out all winter. I don’t bother with the blanching. I grate the carrots, put them in one cup packages and freeze. I have not noticed any difference in taste or texture, especially when you are going to use them for soups. Blanching is a pain and after reading an article about how it actually reduces the nutrients since you throw away the blanching water, I have experimented with just freezing. For most things, it works beautifully and saves me time and trouble. 1. I’ve been working on using excess freezer and pantry items. A partial bag of diced parsnips was added to a pot of lentil stew I had made. The lentil stew is gone so there is a pot of black bean soup on the stove. It’s amazing the amount of beans you get from a pound of dried beans. 2. I have been finding a random coin here or there. I don’t think I’ll have a big six month total at the end of the month but we’ll see. 3. I gave away several items on Freecycle this week. We didn’t need/want them and I’d rather pass them along than donate (despite missing out on the tax break). 4. Soon to be 23 years old child now has her own health insurance. It will save us a bit every paycheck and give her more adulting creds. 5. I put the trash out in the 25+ year old trash barrel. It’s an old Rubbermaid, most likely made in USA. 1. I sell on Ebay and instead of purchasing thank you cards, I raded my stash of blank note cards and used my “thank you” stamp that I had purchased at the Goodwill. Not only will I use the cards, but I decided that I will also stamp the envelopes and use them as well. Instand thank you cards! 2. My son’s school is hosting a Santa’s Secret workshop this week and we all know how cheaply made those items are. So, I decided to take each child individually to the Goodwill to buy for their sibling (I only have 2 kids) and daddy. Each of them found something brand new for daddy and my son found my daughter a brand new toy. I told hubby it was his turn to take them to a store soon. 4. Had a container of peanuts left over from summer camping trips that needed to be used. So, I looked up a peanut brittle receipie and used those babies up! I will need to perfect my “candy making” skills before I make another batch….but it does still taste good. 6. One other win-win about going to the ER on black friday was that it kept me out of the stores! Sending you good thoughts and a speedy recovery. I was also admitted from emergency for Gallbladder surgery. My problem is my last meal was vegan broccoli soup and I can no longer eat it because of the pain associated with it. I hope you can get thru thanksgiving next year. Jenelle I hope you’re on the mend and wish you a full and speedy recovery! Re: #3: My favorite local thrift store (2nd Avenue) is selling $60 gift cards for $50 until December 31. Last year I bought one–and it was gone within 30 days. I learned my lesson! Going to purchase at least two this time, maybe three. I shop there all the time anyway, might as well save some money in the process. 1. Still working on my pile of mending. Repaired a hole in a T shirt and altered 3 Goodwill tops by closing up the necks a little in various ways. Why do manufacturers assume if you wear an extra large, that you must have an enormous head and need an enormous opening to put it through? 2. My husband has a steady stream of ebay packages going out of the house, mostly our estate sale finds. He uses recycled packaging whenever possible. 3. Took a donation to Goodwill and documented it for tax purposes. 4. Sewed up the dog bed for the 5th time. 5. Watching free Christmas movies on Roku and reading free books from the library. Calling a meeting of the Large-Chested, Short-Armed Women’s Support Group (I’m another one!). And I do have long ape-like arms so I have to check that sleeves are long enough. To get something that buttons at the bottom around my sturdy hips while fitting at the top has led me to develop skills sewing side vents in almost all blouses. Susie’s daughter; I love finding 3/4 sleeves! I usually don’t need to hem the length,! Things I’ve scored and not-so-scored at this week. 1. In the “keeping it real” category: I went to the story to buy powdered sugar and .. $100 later I left the store. On-sale Italian sausage was the only meat, no booze, the rest was dairy and rarely on-sale low abrasion toothpaste. As my husband keeps pointing out, we spend a lot but we rarely eat out and seldom throw any food away. 2. The powdered sugar was for icing. Five friends from my old town drove an hour to spend the day with me yesterday. I’d made cookie dough the night before so together we cut-out, baked, and iced 250 cookies! Had turkey gumbo soup for lunch (guess where we got the turkey?). Everyone took a whole bunch of cookies home to share with others. Fun! 3. A friend suggested we get together. We usually meet every few months for breakfast in a town that is a 40-minute drive for each of us. I looked online at the public library in THAT town, discovered they are hosting a free bluegrass concert one evening next week. We will meet at our breakfast restaurant for supper and then go to the Bettman and Halpin concert. We checked them out on YouTube – I think they are going to be kinda awesome. 4. Made a “card” for my 2-year old granddaughter out of some felt pieces. Cut out a simple green Christmas tree, a yellow star, and 5 balls of red and blue felt. It all fit in one envelope. Felt sticks to felt, so this is a super-simple do-it-yourself holiday toy just for her. 5. Bought one small box of candy canes for the car. We are in the car more than usual visiting kids and friends so I am celebrating with the taste of peppermint when I drive. No hall of blood-red Christmas trees for me. Loved your story, Mary Beth! Thanks for the book recommendation, I was wondering if it was good. So you might mention that using the padded (or even non-padded) mailers for mailing cuts the expense nearly in half. (not happy with the USuckmachinePS) It’s better to not use their envelopes – harder to reuse them. I do the McThang not often, figuring it’s not really food and also they have excellent coffee. If you are ABLE to buy a Lear jet, then good job not getting one. Ur son better get a job soon. Love reading all of your frugal ideas! You folks rock! Great inspiration! 1. After 6 months abstaining, gave in to offer at take & bake pizza place & also redeemed free item for completing survey. For $14, got 2 large pizzas & 1 cheesy bread pizza. 2. Made a bee line to my local spice shop after work to redeem coupon for free cinnamon. Prefer to use their fresh, natural spices for baking to boost flavor. Free is my favorite cost. 3. Got out several “free to me” holiday decorations, courtesy of very large box of Christmas stuff offered for “free” last year on Nextdoor after the holidays. I was cursing at the time because the large, heavy box hurt my back. However, it was a delight to unpack a large, pre-lit table top tree with lighted angel topper; a Dept. 56 “Santa’s Reindeer Rides” lit & animated display (retail $50, new in box) & a festive holiday sign. I had to sift through many unwanted items directed to garage sale & am still in search of remaining items in basement after DH “organized”. 4. Very pleased with quality of hand designed holiday photo cards. This is my 1st attempt at design, as previously ordered cards or photos from photography studios. Since they are becoming obsolete, happy that the quality of my online efforts are fairly similar to professionally designed cards. Lower cost = higher quantity of cards ordered. 5. In lieu of going out to eat for DH’s upcoming birthday, plan to make double batch of his favorite casserole instead. Katy, I read about your cat-pee nuked sofa on your Instagram. We use Nature’s Miracle enzyme cleaner (owners of three rescue dogs and two rescue cats). It works well, although you may need repeated applications due to the tightness of the spot the kitty peed into. Maybe you can celebrate paying off college by getting that gorgeous sofa reupholstered? If you download the Burger King app and you go within 600 feet of a McDonald’s – a coupon will pop up into your app for a Whopper for a penny! 1. Neighbors house was sold and being bulldozed by new owners. We and several other neighbors were allowed to cannibalize the house before the wrecking ball swung, and I’m so impressed with how much stuff was diverted from the landfill. By the time the house fell it was down to a shell. 2. We will use the 15 year old steel roof to redo the ones on our shop and lake cabin. 3. The 2 year old seamless rain gutters have been reinstalled on 2 of our rental properties that needed new ones. 4. New outlets/switches and covers had been put in the house in the last 2 years. We removed them all and will be using them to update the 20 year old ones in another rental house. 5. The less than one year old touchless flush toilet was cleaned and installed in another rental house to replace an older toilet with a scratched up bottom from being snaked. That is amazing! I can’t believe the properties that are considered knock-down in some real estate markets. 1) Scrounged for lunches this week and ate a bland diet because I have had an upset stomach for 6 days now. Boring, but helped and was cheap. Everyone else packed lunches all week too. 2) Opted to put up our fake tree this year, even though I really wanted a real one. Just didn’t want to spend the money. 3) I have been craving salmon, but so far have resisted the urge. Focusing on cheaper meals – tonight spaghetti with a red sauce (canned from summer tomatoes), breakfast for dinner this week, etc. 4) Paying library fines with canned goods I had around the house. Win-win for me and the foodbank. 5) Opted not to exchange gifts with my coworkers and instead just go out to dinner next week. It should be relaxing and fun, versus stressful trying to find a decent gift for cheap. 1) I attended the free Christmas dinner and Vegas night at Hubby’s workplace. The food was delicious and the games were fun. I’d never played Blackjack or Roulette before. They gave us $1000 of play money/chips and I learned how to bet and play both games. It was a hoot! 2) I fixed a large crockpot full of beef stew, so it’s leftovers for lunch today. YUM! 3) The free ear phones/swag from a Vendor at the Digital Government conference came in very handy. My clamshell earphone, I use at work, is over a decade old and it gave up the ghost last week. I finally remembered the free ear phones I had in my purse. Now I can listen to jazz on my Amazon Music account again. 4) I’m about finished with another audiobook “The Summer of 1927”. It’s a very interesting book on historical events from the 1920s, culminating in several things that happened that one Summer – Babe Ruth’s homeruns, Charles Lindberg’s flight to France, political events, trials, immigration, etc. I’m always amazed at how little I really know about U.S. History. 5) Spending my Amazon Prime points on Christmas gifts. 1. Car’s muffler fell off the same week it got a flat tire. Thankfully hadn’t already allocated a vacation time buyback from my company, so it went directly to the repairs. Since it wasn’t part of my budget, I didn’t feel the sting. 2. Went skiing on Saturday using free passes that expire next weekend. Thankful to not have paid, since my friend hurt her knee. Spent some of the cash that would have gone towards lift tix on some fun boozy hot chocolates in the lodge to make her feel better! 3. At the point with the fridge where I’m just bringing random things to work. Today’s lunch: an entire cucumber, a bag of baby carrots with ranch dressing, and a protein bar. Better than stuff ending up in the trash, and no strange looks chopping up a cuke at my desk! 4. Got real honest with my family about holiday spending this year, which means we have opted to split gifts for other family members. This way they are getting something they actually want-instead of what we can individually afford- and no one has to pay more than $30 per person. Next post: Happiness Project Giveaway!